It couldn’t be the same Will could it? No, surely not, ‘William’ was a common enough name and plenty of people shortened it to ‘Will’. ‘I couldn’t deal with his immaturity and his inability to make an effort in our relationship, you know, to just accept responsibility for his actions some of the time. He could never admit that he was wrong; he constantly expected me to take the blame.’ Melody sighed. Anna wondered. Could Melody be talking about the Will she knew? There was a chance. Anna started involuntarily. That was Will’s surname. It was unusual, she’d never heard it before or since, it had to be the same person surely? ‘Are you all right?’ Melody had turned to face her and was giving her an odd look. ‘No…no I heard the name once and it stayed with me,’ Anna lied. I can’t argue with you there, Anna thought. 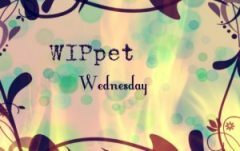 If you would like to take part in WIPpet Wednesday, all you have to do is post a section of your current WIP on your blog that relates somehow to the date, so it being the 27th today you could post twenty seven lines from chapter twenty seven or twenty seven words and so on. Then add your name to this linky and you can look at all the other great WIPpeteers’ work! Thanks once more to K.L. Schwengel for hosting. Hi Kate. Well I can reveal more next week 😉 but I’ll give you a hint…Anna has no time for Will. That’s all I’ll say for now though!! I know we’re supposed to be focused on Anna, but I felt so sorry for Melody! I guess Anna’s experience with Will couldn’t be much better, though. Interesting you say that. I hadn’t given Melody’s story that much thought but yes you do feel sorry for her. She’s had a rough time of it. Oh yes – poor Melody too. And poor us… just keeping us out of the loop… will be back next week, (of course) – what is it about this Will? That’s the one bad thing about WIPpets . . . they leave us hanging! Hmmm…. now I *really* want to know more about Mr. Will Schoddy. Oh man “‘I couldn’t deal with his immaturity and his inability to make an effort in our relationship, you know, to just accept responsibility for his actions some of the time. He could never admit that he was wrong; he constantly expected me to take the blame.’ Melody sighed.” —- we all must have someone in our lives who fits this description and I feel her pain!!! It connected me right away with your characters, but then so many unanswered questions!! Hope you plan to answer a few more of them next week! Yes I do, most definitely! 🙂 Thanks for a great comment. Poor Melody… and I sense trouble ahead for Anna! I want to know more about this Will… Great excerpt! Yes Anna will go through a lot during the course of the story. Will is important too…Watch this space!